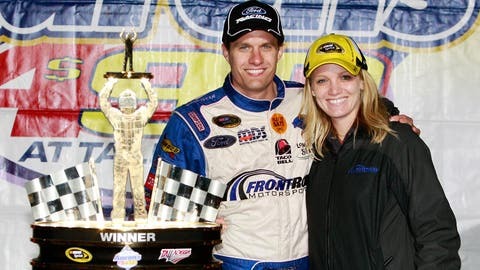 David Ragan celebrates with wife Jacquelyn after winning the Aaron's 499 at Talladega Superspeedway on May 5. David Ragan will soon join the growing list of Sprint Cup Series drivers who have joined the ranks of fatherhood. Ragan, whose win at Talladega Superspeedway in May provided easily the biggest upset of the 2013 season, told FOXSports.com on Tuesday that he and wife Jacquelyn are expecting their first child next summer. "We’re excited about that and we’re looking forward to it," David Ragan said. "I’m sure it’s going to open a whole other chapter of our lives and we’ll see things from a totally different perspective all over again." The Ragans have not yet announced the news on Twitter, a popular source of information about the off-track lives of NASCAR drivers and other members of the NASCAR community. David Ragan, a second-generation NASCAR driver who joined the Sprint Cup Series fulltime with Roush Fenway Racing in 2007, has spent the past two seasons with Front Row Motorsports, where he will compete once again in 2014. The 27-year-old native of Unadilla, Ga., owns two victories in the sport’s premier division, the first one coming with Roush Fenway in the July 2011 race at Daytona International Speedway.